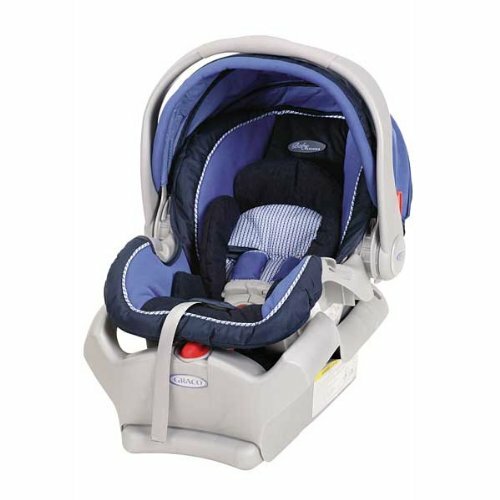 Dimensions: 15.6H 18.7W x 30.7D"
We decided to buy this Graco Snugride® 35 Infant Car Seat in Nolan at the last minute although we already had this Anakku Infant Carrier Car Seat. The reason so because we were searching high and low for an infant car seat with a base. This is so that we don't have to instal/strap the car seat belt around the car seat every single time baby travels in the car. The hassle is that we could only instal it after we strap baby into the car seat. This is from troublesome to super convenient. However, most of the infant car seat that has a base costs so much. I was eyeing the Maxi-Cosi Cabriofix intially but then even after discount the car seat is RM699 and the base is sold separately at RM999. Yes, the base costs more than the car seat itself which I find it so ridiculously priced. I'm most certain I won't fork out so much for an infant car seat which most probably I will use for just a year. This seat is a top-rated seat in the U.S and has won some award in the US. At a glance, the features are impressive. However, we don't make use of all these features. But what I like about this infant car seat is that the safety features are top-rated, with excellent standards of rigorous crash and side-impact tests. 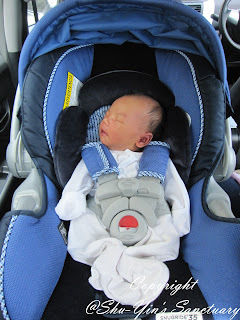 And I like the fact that it is slightly bigger than other infant car seats so that it can accomodate a bigger baby. And even if your baby is smaller during birth, it is still ok with the infant head support cushion, which is removable once baby gets bigger. So it was no problem putting Khye inside it when he was an infant as he was a hefty 3.99kg during birth. Our cars doesn't have the isofix brackets, so we have not tried the 'Latch' installation. But looking at the manual, it is even easier to instal the base with it. We use the 'Seat Belt' installation and I super like the belt lock-off function in the base which is so much easier to instal the seat belt, although we don't instal it often. But then the belt-lock off function at the base is so stable and tight and doesn't move at all after installation, which I find it very safe. We don't make use of it as a carrier. 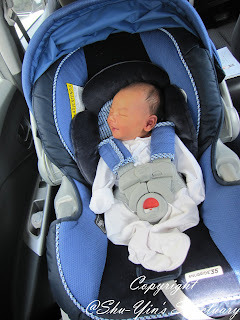 This infant car seat's weight without the base is 9.7 lbs (~4.4kg) which is rather heavy. And once I put the baby in it, it weighs like a tonne. So there is no way I'm carrying the baby inside it alone. But there were a few times when hubby was around, we used it as a carrier. 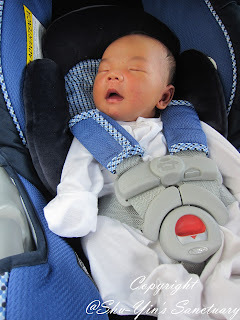 Khye fell asleep in the car seat, and when we reached our destination, we hadn't the heart to wake him up. So since we won't be long, so hubby just lifted the carrier (with Khye inside) off the base, and brought him out. Left him on the floor and he was still sleeping away. 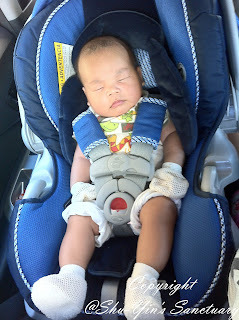 After 15 minutes or so, when we went back to our car and clicked the carrier in place, Khye didn't even stir. And there was another time when we went to my friend's house. 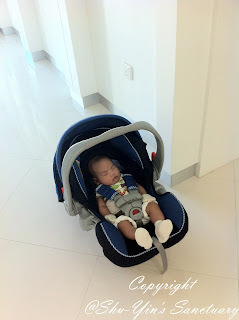 We used it as a carrier when we brought Khye inside and rocked him to sleep there. But that was about the only few times we used it as a carrier. Usually, I will just use the stroller if we are going to a restaurant or something. However, we don't have a Graco stroller, so we can't use it as a travel system. But I am pretty happy with this purchase. 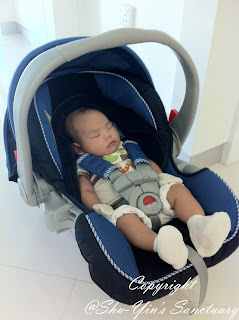 Here are a few photos of Khye sleeping contentedly and happily inside Graco Snugride® 35 Infant Car Seat. 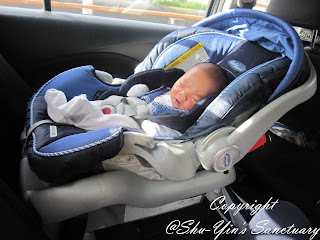 All in all, this branded car seat is a good buy at the price of RM699. I find it so much useful and suitable for me compared to my previous car seat. I love this, and have totally no regrets buying it. ***Please take note that this post is NOT sponsored. 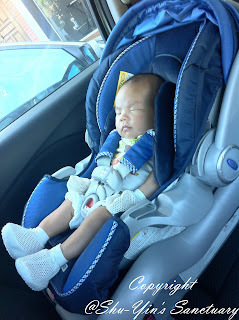 I purchased this Graco Snugride® 35 Infant Car Seat with my own money. All text and opinions are of my own and represents my honest opinion of the product(s). hi, thanks for sharing this very useful information on Graco Snugride 35! I plan to buy 1 from Peekaboo soon too for my newborn EDD 16th Feb 2013. Initially quite reluctant to invest and later unsure brand but your blog has inspired me alot so we have decided to buy one! Thanks for sharing the blog. I have been looking for the car seat for my baby. I love the look and safety feature of Graco snugride 35 . And its other feature like adjustable canopy , 5 point harness safety. Thanks for the detailed review Shu-Yin Tan. 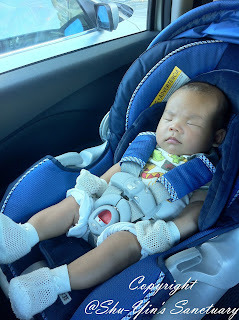 I've been so confused with the car seats available in Malaysia. Want something safe but affordable. Thanks again.